Most of us today are probably experiencing that same kind of battle going on within us, for how else could we feel in the face of the killing field in Boston that flashed on our television screens endlessly yesterday? I don’t think any of us could honestly say that anger didn't well up in us as an initial reaction when we watched people falling down in a street overshadowed by the smoke from two bombs. Most of us harbored a lively hostility for the unknown perpetrator(s) who dared to invade the city that could be called our birthplace of freedom. I think that we struggle daily with this dichotomy of Linus love/hate. But we go on. We go on mostly because we’re a faithful people….and a loving people. After 9-11, I remember President Bush quoting at a service in the National Cathedral in Washington: “Adversity introduces us to ourselves. This is true of our nation as well.” We were introduced to this notion that Americans are models for the world immediately around us…and those in the world who are farthest from us. That awful time taught us that we’re often observed, with great scrutiny, under circumstances of acute distress and horror, to see how we’ll react. And what those who looked at us yesterday saw was that with grace working in the hearts of those “helpers,” evil was broken down and destroyed. I’m sure there were many stories of generosity and goodness being lived out in Boston yesterday, and some scribe should write them down so that other generations can read them and be inspired. Most of us who are Christian believe in peace and in an inward and invisible grace we receive at baptism. One writer has said that the grace that God gives us works like salt–it preserves every grain of goodness it can find and heightens its flavor. We have that salt because we have something called the theology of hope. And although we often groan inwardly, we wait and work in hope. That wonderful theology of hope stands against destruction, conflagrations, and the madness of terrorism. Through our faith… hope… and God’s grace, we’re always being given a transforming gift–something called the gift of love. 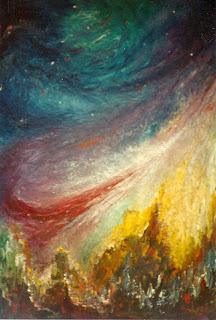 Painting at beginning of blog is entitled “Tomorrow” by my brother Paul Marquart.